Many St. Patrick’s Days ago when I first started working for POPSUGAR, my colleagues Maggie and Lizzy Eisenberg brought in this Irish soda bread, courtesy of their mother, along with a huge tub of Kerrygold butter. Never in my life had I ever experienced either, so I toasted a slice of the raisiny bread and slapped a generous pat of butter over the top. The butter seeped through the bottom of the warm toast, and the instant I took a bite, I became a Kerrygold convert (here’s a story on how deep my love runneth) and a soda bread supporter for life. I distinctly remember returning for seconds and thirds of the comforting bread, soaked in the liquid gold. The memory of that bread lingered for years, and I knew I had to get my hands on the recipe. I reached out to the sisters, and their mother shared the lovely tale of the bread along with the recipe. 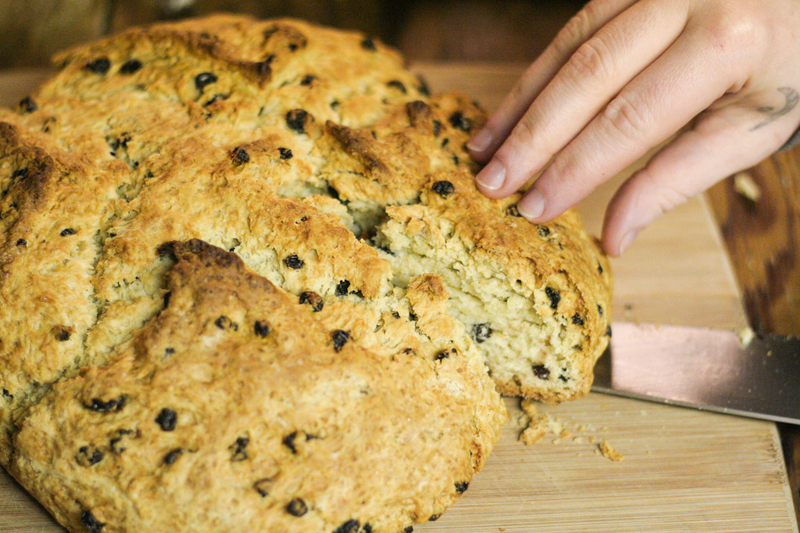 Unlike yeast-based breads, this Irish soda bread comes together quickly and easily. It’s an ideal weeknight bread, and if raisins and caraway seeds do not appeal to you, they can easily be left out or substituted for other herbs and dried fruits. Do not be alarmed if the dough appears quite wet. It will transform into a tall, pillowy loaf after baking. Once it’s out of the oven, let it cool. This is an important step! The gluten proteins need to set, so the bread is fluffy (not gummy) when cut. Once cool, slice and spread with softened butter. Or toast up and then dollop with butter. Ah, this bread tastes just as good as if an Irish grandmother made it. A cast iron skillet is an important part of Nora’s recipe, but if you don’t have one, use a cake pan, or form the dough into a round shape and bake on a cookie sheet. Keep in mind the cooking time may need to be adjusted. For instance, a 8-inch cake pan may require an additional 30 minutes of baking. Preheat oven to 350°F. Grease a 9-inch heavy iron frying pan. In a large mixing bowl, blend butter and sugar together with a wooden spoon. In a separate bowl, combine milk, soda, caraway seeds, and raisins, then stir into sugar mixture. In a bowl, sift flour, baking powder, and salt, and gradually add to sugar-milk mixture, beating with a wooden spoon, until a wet dough forms. Turn into the prepared pan and bake for 1 hour, or until a cake tester comes out clean. Turn out of pan and cool about 30 minutes before cutting. Slice and serve with butter.